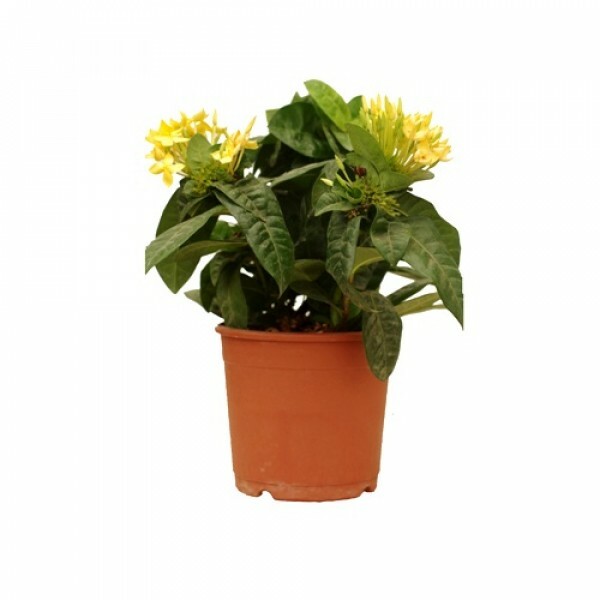 Also known as flame of the woods or jungle flame, Ixora (Ixora coccinia) is an evergreen shrub with a rounded shape and attractive, glossy foliage. Blooms in shades of pink, orange or yellow, depending on the variety, appear nearly all year round. Although the plant can reach heights of up to 12 feet, it usually tops out at 4 to 6 feet in the home landscape. Ixora is suitable for planting in the mild climates of U.S. Department of Agriculture plant hardiness zones 10 through 11. Light: Bright light, but avoid direct sunlight in summer. Water: Keep soil continuously moist, but reduce watering in the winter. Very high humidity is preferred. Temperature: Above 60ºF is preferred even in winter. Avoid cold drafts if temperature drops lower. Soil: These acid-loving plants thrive in rich, moist, peat-based soil. Fertilizer: Feed in spring with slow-release pellets or weekly during growing season with liquid fertilizer. Take cuttings in the spring. Rooting ixora is difficult, and you might need rooting hormone and bottom heat for success. Water Ixora as needed to keep the soil evenly moist, but not muddy. Although the plant prefers moist soil, it may rot in excessively soggy soil. Water the shrub sparingly during the winter months. Feed Ixora in early spring, using an acidic fertilizer formulated for Ixora, azalea and gardenias, which has a ratio such as 4-8-8, along with minor elements that are beneficial. Repeat in midsummer and autumn. Acidic fertilizer is especially important if the foliage takes on a yellowish cast, indicating a magnesium deficiency caused by improper soil pH. Apply the fertilizer according to label specifications, then water deeply. Spread at least 3 to 4 inches of organic mulch such as pine needles, compost, shredded leaves or bark chips, on the soil around the Ixora plant to conserve soil moisture and help maintain a proper acidic soil pH. In spring, remove the mulch along with the top crust of soil. Replace the removed mulch and soil with fresh mulch. Prune Ixora after blooming slows in late autumn or anytime the shrub looks untidy. Prune each shoot down to just one bud or prune the shrub as needed to create the size and shape desired. Izora shrubs tolerate pruning well and can be trimmed back by several inches without harm. However, many gardeners prefer to leave the shrub unsheared for a more natural appearance. Protect Ixora from aphids and scales. Aphids are tiny, green insects that congregate at joints of the leaves and stems or the undersides of the leaves. Scales are hard-shelled insects that give the foliage a waxy appearance. Regular application of an insecticidal soap spray or neem oil usually helps to control both pests.